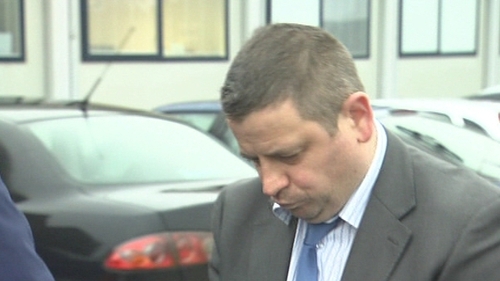 A former post office manager has been sentenced to four years in prison after stealing €1.75m. Wexford Circuit Court heard that Tony O'Reilly, 37, from Hacketstown Road, Carlow town, took the money over a 14-month period to feed his gambling habit. It included putting a bet of €40,000 on a game involving the Norwegian women's soccer team. O'Reilly pleaded guilty to 14 charges of theft and falsifying accounts when he was branch manager of the post office in Gorey, Co Wexford, in 2010 and 2011. The incidents only came to light in June of last year when a regional audit was being done. Wexford Circuit Court heard that O'Reilly had developed a chronic gambling problem. He had an account called Tony 10 with Paddy Power bookmakers. Detective Ian Hayes of Gorey Garda Station had told the court that O'Reilly said the theft started at the post office by sometimes taking a bag of coins from a larger bag, which then was not checked. If it was a bag of €2 coins, he would replace it with a bag of 2c coins so as not to highlight the weight difference. In April 2010, O'Reilly had taken around €8,000, which increased over the months to €60,000 and by the end of the year he had taken €290,000. At that stage, to cover himself during an audit, he brought an accountable receipt for €97,538 into the toilet with him at work and changed it to €397,538, thus concealing the misappropriation. The following six months he lost the run of himself, the court heard, and was involved in sporadic, random and worldwide bets, including betting €40,000 on the outcome of a match involving the Norwegian women's soccer team. His method of taking money out of the post office included removing €50 notes with a pliers from the middle of a bundle of notes containing €50,000. Gardaí said O'Reilly, who is married and has a two-year-old child and lives in Carlow, co-operated at all times with them. He joined An Post in 1998, and worked for a time in Tallaght before returning to Carlow. In 2009, he was appointed manager in Gorey. He was known as "The Golden Child" in An Post because he was so young when appointed manager. His defence counsel said O’Reilly did not benefit at all from the money; that he still lives in an ordinary, modest house; and that Paddy Power bookmakers had viewed him as a highly valued customer, even bringing him on all expenses trips to the Europa League Final in Dublin and the Irish Derby race meeting. He also said alarm bells should have gone off with the bookmakers. The court heard O'Reilly has given up gambling completely, has attended courses at addiction centres, wants to become an addiction counsellor and has co-operated fully with gardaí. This morning Judge Pauline Codd said O'Reilly had the pattern of somebody out of control, and as he said himself, had lost the run of himself. She said he had engaged in a serious breach of trust over a significant period of time and his theft was deliberate and systematic. She also said he had disappeared for 11 days after the theft was discovered. In mitigating factors, she said he had no previous convictions, came from a respectful family, what he did was totally out of character, he was in the throes of a gambling addiction, accepts fully and sincerely regrets his actions and has taken significant steps at addiction counselling. She added he was at a low risk of reoffending and he assisted the gardaí fully after his return and pleaded guilty, thus saving a lengthy garda investigation. Each charge carried a maximum sentence of ten years. She sentenced him to four years in prison but suspended the final year on condition that when he comes out of prison he attends further gambling addiction counselling. Members of his family were in court and his wife broke down in tears when the sentence was being handed down. The bookmakers Paddy Power has not yet commented on the case.